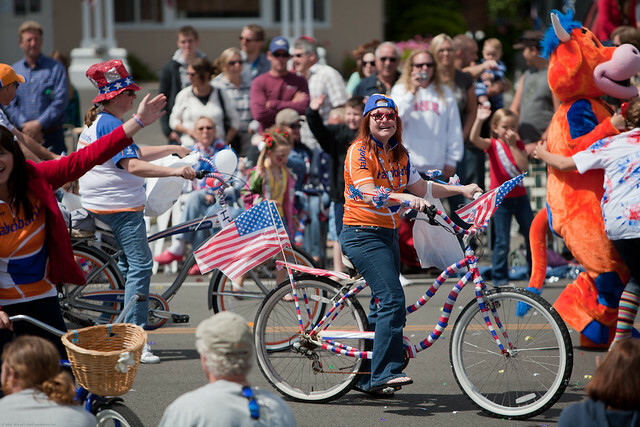 July 4th 2010 Parade in Cayucos, CA - an exhibition of Americana Patriotism Central Coast California Culture | Flickr - Photo Sharing! July 4th 2010 Parade in Cayucos, CA - an exhibition of Americana Patriotism Central Coast California Culture with few peers. 54 images of flags, cheers, music, civic organizations, military, first responders, entrepreneurs, dancers, kids, adults, boats, tractors, floats, candy, leis, flower necklace, musical instruments, dogs in costume, mermaids, beauty queens, drag queens, belly dancers, fire engines, fire trucks, police cars, streamers,dancers, acrobats, gymnastics, gymnasts, bikes, stilts, clowns, cross dressers, balloons, hula skirts, god, jesus, freaks, body art, tattoos, smiles, euphoria, cleavage, tank tops, sports bras, kelp, kelp horns, instruments, sharks, hats, wild colors, tacos, BBQ, barbecue, food, celebration, families, unicycles, beautiful people, people watching, and much more. A well-behaved more-or-less alcohol-free and more-or-less cigarette-free event. You had to be there to appreciate this crowd. Photo by "Mike" Michael L. Baird, mike [at} mikebaird d o t com, flickr.bairdphotos.com; Shooting a Canon EOS 5D 12.8 MP Digital SLR Camera, Canon EF 70-200mm f/2.8L II IS USM Telephoto Zoom Lens for Canon SLR Cameras, with circular polarizer, handheld. Most shots in this series were shot wide open to slightly blur the background to gain viewer focus on the subject. To use this photo, see access, attribution, and commenting recommendations at www.flickr.com/people/mikebaird/#credit - Please add comments/notes/tags to add to or correct information, identification, etc. Please, no comments or invites with badges, images, multiple invites, award levels, flashing icons, or award/post rules. Critique invited.